This short tutorial presents a simple "Hello, World!" program for the STC89 DEMO BOARD. The author used a Debian GNU/Linux system, but the tutorial should work for other Linux distributions, *BSD or other Unices. stcgal, to write programs onto devices. To supply power, to write the program and for serial communication the board is connected via Micro-USB. stcgal can be found at its GitHub location, where there is also a download link for a zip archive. It is written in Python, and assuming the necessary libraries are installed, can be invoked directly without any need to be built first. // Configure UART for 9600 baud, 8 data bits, 1 stop bit. SCON |= 0x02;				// Tell putchar() the UART is ready to send. The demo can be compiled simply by invocing sdcc using sdcc -mmcs51 --std-c99 serial.c assuming the C code is in serial.c. The option -mmcs51 selects the target port (mcs51). An .ihx file with a name corresponding to the source file will be generated. Assuming the serial cable is connected, stcgal.py serial.ihx will write the demo onto the board. You need to power-cycle the board after invoking stcgal. You can see the "Hello world" by using a terminal program configured for 9600 baud, no parity, 8 bits, 1 stop bit and no flow control. stcgal is an STC MCU ISP flash tool for programming STC 8051 compatible microcontrollers written by Grigori Goronzy. 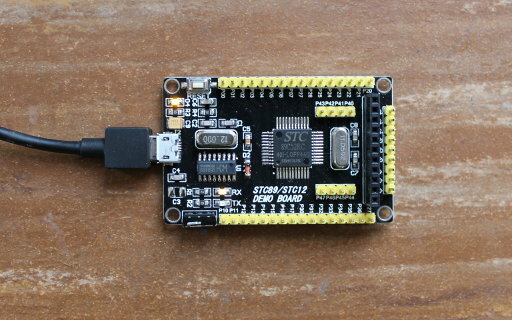 STC microcontrollers have an UART / USB based boot strap loader (BSL), that stcgal communicates with.